39.8mm 18K pink gold case, 9.08mm thick, seven-sided crown set with a faceted sapphire, sapphire crystal, silvered opaline dial with blued-steel sword-shaped hands, caliber 1847 MC automatic movement, 18K pink gold bracelet with SmartLink bracelet resizing system and QuickSwitch bracelet interchangeability system. Water resistant to 100 meters. Comes with second QuickSwitch allilgator strap with 18K yellow gold double folding buckle. 39.8mm 18K pink gold case, 9.08mm thick, seven-sided crown set with a faceted sapphire, sapphire crystal, silvered opaline dial with blued-steel sword-shaped hands, caliber 1847 MC automatic movement, dark grey alligator strap with QuickSwitch bracelet interchangeability system. Water resistant to 100 meters. Comes with second QuickSwitch calfskin strap with double folding buckle. 39.8mm 18K pink gold case, 9.08mm thick, sapphire back, seven-sided crown set with a faceted sapphire, sapphire crystal, skeleton dial, caliber 9619 MC manual winding movement with skeletonized bridge forming Roman numerals, 18K pink gold bracelet with SmartLink bracelet resizing system and QuickSwitch bracelet interchangeability system. Water resistant to 100 meters. Comes with second QuickSwitch allilgator strap with 18K yellow gold double folding buckle. 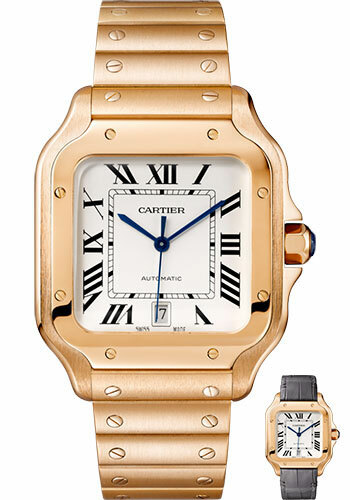 39.8mm 18K pink gold case, 9.08mm thick, sapphire back, seven-sided crown set with a faceted sapphire, sapphire crystal, skeleton dial, caliber 9619 MC manual winding movement with skeletonized bridge forming Roman numerals, dark grey alligator strap with QuickSwitch bracelet interchangeability system. Water resistant to 100 meters. Comes with second QuickSwitch calfskin strap with double folding buckle.